Foundation Skills DVD - 3 disc set. 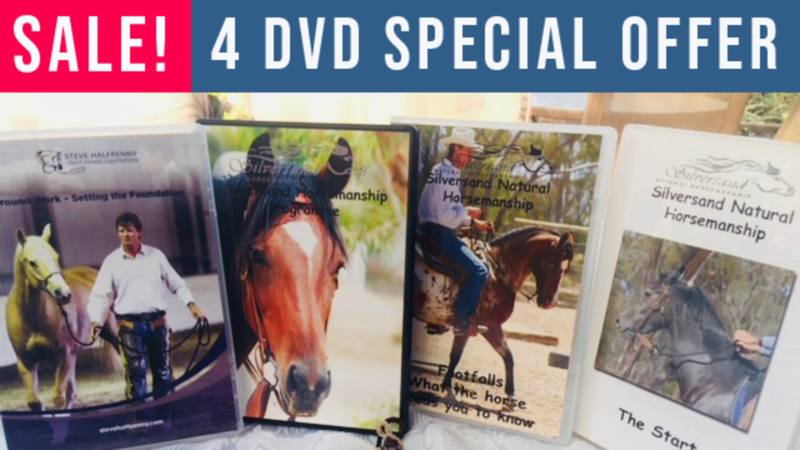 These famous DVDs are the foundation of Light Hands Equitation. DVD 1 starts at the beginning with a young horse that has done very little and scared of humans, to his early rides. It shows how to begin teaching your horse to follow the feel of the lead rope, how to trailer load, how to catch your horse and lots more. Then all the basic skills are shown again on an older experiened horse to show how it should look when the horse responds well to the cues used. Footfalls DVD. Learn how to influence your horse by getting in time with it's feet. This is a skill that every rider needs to know and will make a HUGE improvement in all of your ridden work. Groundwork DVD. This DVD is great for those who have already bought the 'Groundwork for Softness' DVD, and offers more advanced groundwork lessons including checking and building confidence, moving the horse using energy and intent, moving the horse from feel (physical pressure), and using feel and energy to move horse and prepare for riding. The Start DVD. Follow the story as Steve starts a warmblood horse, giving this horse a great start to it's ridden life. This DVD has lots of insights and aha moments for working with young horses. There are just 35 of these bundles left. These bundles are only available for customers in Australia, New Zealand, Europe, UK. (We cannot ship to the USA or Canada as these are PAL format DVDs). Purchase today for $99 plus $10 shipping to Australia, NZ & Europe. To celebrate a very successful European tour, we are having a FLASH sale of some of our best-selling horsemanship DVDs. There are just 35 of these DVD bundles available.